Here it is, the first zombie flick of this year’s Horrorshow, and it’s a good one. 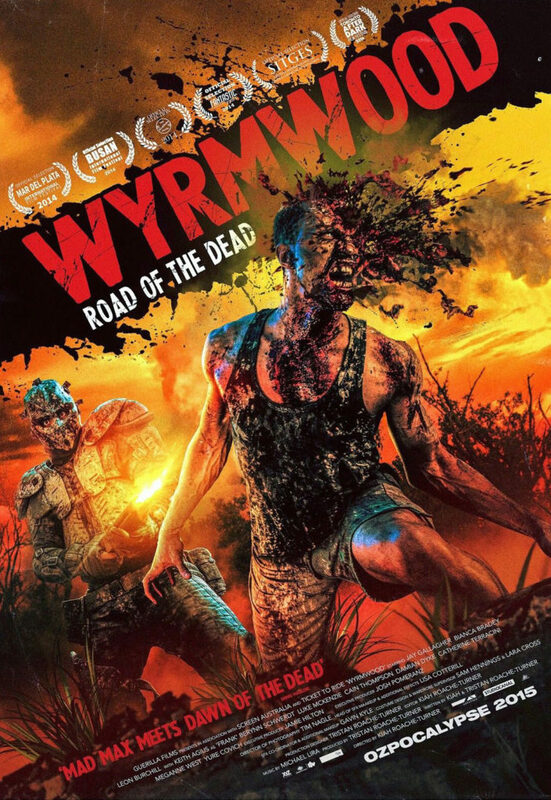 Wyrmwood: Road of the Dead is an Australian film from 2014, written by Kiah Roache-Turner and Tristan Roache-Turner, and directed by Kiah. Taking place mostly in the middle of nowhere, Roache-Turner used a tried and true method — isolation — to stay within the bounds of a very small budget. But one of the great things about film in the 21st century is that budgetary constraints mean a whole lot less than they used to. Wyrmwood had a budget, as reported on the internet, of only $160,000. That’s extraordinarily small for a feature film, akin to films such as Clerks and Paranormal Activity. In rural Australia, something is amiss. After a spectacular late night meteor shower, people begin to turn into flesh-eating zombies. But not everyone, of course, otherwise there would be no movie. The opening scene stakes this flick’s place in the zombie subgenre of horror. A garage door opens and out step warriors, armored head to toe in hockey and football gear, and armed to the teeth. The hordes don’t stand a chance against these blokes. Their aim is true, and zombie heads go splat all over the screen. While not played for laughs, the gore in this film is very much tongue-in-cheek. That’s a good thing, because Roache-Turner and company couldn’t afford good F/X. Since they don’t take it all that seriously, there’s no need for a viewer to, as well. These heroes, whom we meet later on sans all the gear, are Barry, Benny, and Frank (Jay Gallagher, Leon Burchill, and Keith Agius). Before the zombie outbreak, they were all perfect strangers, but circumstances have thrown them together. Benny and Frank are concerned mainly with survival. Barry, however, is most concerned with reaching the wonderfully-named town of Bulla Bulla so he can rescue his sister. Barry has had about as bad a day as someone can have during the zombie apocalypse, and finding his sister is his last hope for personal redemption. Barry’s sister, Brooke (Bianca Bradey), is indeed in trouble, but not in the manner in which Barry believes. She has been kidnapped by soldiers and shackled to a wall in a room full of captive zombies. There, she is subject to sadistic experiments carried out by an outlandish scientist (Berryn Schwerdt), listed only as The Doctor in the credits. The Doctor is a real treat in this flick. Rarely has a mad scientist in a horror flick gone about his work with such glee. He never appears outside of a hazmat suit, keeping him at a distance from other characters and viewers alike. He’s like a little kid banging on the glass at the gorilla enclosure at the zoo, confident that he is untouchable and safe. All that remains for the film is Barry and his little group to reach Brooke and give the doctor his comeuppance. Sure, it could play out that way. Or, Brooke could not be that much of a damsel in distress, after all. A viewer will have to watch and see. The zombie subgenre has been around for over half a century now. It’s getting harder and harder for filmmakers to come up with something original. Boilerplate zombies, even when done well, might not be enough for audiences today, especially since The Walking Dead has cornered the market on such traditional, rambling undead. Filmmakers would do well to distance themselves from that horror behemoth. Wyrmwood does that. It has a unique take on zombies, and has fun with plot, characters, and gore. Wyrmwood is a freewheeling film, using the absurd to allay any heaviness which might weigh things down and make the experience of watching too dour for all of us on the other side of the screen. It’s worth seeking out.